Turn-based combat has always been a taboo for the MMO genre. Perhaps because the turn-based combat slows down the mechanics of the game or simply because realizing an MMORPGs with turn-based combat, goes to filter many videogamers. So the list of games that contain these mechanics is really short, or at least titles that are worth mentioning are few. Various activities like crafting and job system. I will update this list as soon as something new will coming out. Let’s start with the list. While if you are looking for a good competitive pvp turn-based game take a look here. One of the first games that tried to mix the mechanics of turn-based combat with those of the classic MMORPGs. We will have to travel the world, visiting cities, accepting missions, crafting objects and doing various activities. The battles are turn-based on 3×3 grids and we can choose characters from different classes. Each class will have its own growth and skills. Created by Ankama Games, Dofus is a tactical turn-based RPGs. Surely among the best MMORPGs. The game contains all the elements of multiplayer games, in fact we can play professions, join certain guilds, visit dungeons and carry out quests. At the beginning of the adventure, we will have to create our character choosing among the many available classes and develop it using objects in the game. The Dofus evolution. Wakfu presents new classes and new mechanics compared to its predecessor. To date the best MMORPG with turn-based combat. Definitely, the most recommended on the list. Turn-based tactical combat: Tired of brainlessly running through the forest pressing 1, 1, 2, 1, 1, 3, on every monster that jumps on you? Discover our turn-based tactical combat system, anddevelop a more creative strategy to defeat monsters that will keep challenging your tactical skills. 18 original classes: No standard knight, ranger, mage and cleric here. Discover our 18 classes, each with their unique set of skills and gameplay. From Foggernauts, the robot wreckers, to Xelors, masters of time, you’re sure to find the character that’s right for you. One of the most recent MMORPGs that has been successful and received many positive reviews. Gameplay of a deep interesting, unique RPG with some interesting mechanics like building your base of operations, plunder dungeons for loot, crafting system and much more. Housing as a core feature: Your Base of Operations (BOO) starts as a humble bedroll and can be built and customized into a mighty fortress where you stash your loot. Character customization: via class, race, build, gear, cosmetics, costumes, pets, mounts, and more. Crafting: Use, sell, trade, or enter items into competitions. Be a full-time crafter or merchant. 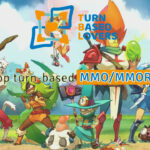 Do you know other turn-based MMO/MMORPGs? Write in the comments or on our Twitter page. In the meantime, take a look at our lists to discover new turn-based games.